As I mentioned the other day, we recently went to visit my family in Winnipeg, MB and took the opportunity to seek out a few gluten free restaurants and places while we were there. Another place that I always make sure to stop into when I am in Winnipeg is Meyers Drug Store. You are probably think why would Amanda & Abisaac make a point of stopping in at a drug store and more importantly why would they bother sharing this information on their gluten free blog. Well....for those who have never heard of Meyers drug store or have never been to Winnipeg, I will tell you that Meyers drug store carries a huge variety of gluten free food items. So huge that I would wager a guess that more of the store is filled with gluten free foods than medications, though I will admit that I have only ever bothered to look at the foods and never the medications. 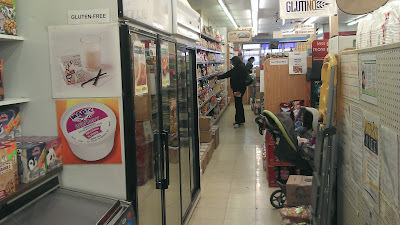 They carry a lot of gluten free products that you do not often see elsewhere. I am sure that if you went looking around at a bunch of different stores you could probably come up with these items or at least many of them, but then you would have to go from store to store to store and who wants that! Whenever I am at Meyers Drug store though it is tempting to go for old faithful and get the items that you know you like, I try to pick up things that I either cannot easily find or have never seen and take the opportunity to try new things. During this visit we picked up some Namaste Foods Gluten Free Barbecue Coating Mix and Homestyle Coating Mix. We also got some Mrs. Crimbles Cheese Crackers as well as some cookies (sorry they were so tasty that we ate them all and I now cannot remember which company makes them). As we were staying in a hotel that served a continental breakfast and I was uncertain if I would be able to eat much there I picked up some Love Grown Foods Raisin Almond Coconut Crunch cereal, which was excellent. Lastly, we got some Barkat Sage & Onion Stuffing Mix to try at some point, too late for Thanksgiving unfortunately. Honestly the biggest problem with this gluten free shopping trip was that I had to limit my purchases due to weight restrictions on the airplane on the way home, otherwise I am certain that I could have come home with even more gluten free items to try. Maybe next time! If you find yourself in Winnipeg anytime soon, I recommend you check out Meyers Drug Store and their massive variety of gluten free products. Thank you for the shout out and kind words! We are very appreciative and are pleased to lend a hand when it comes to finding Gluten-Free food!